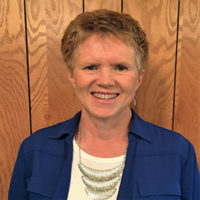 My name is Martha Ellis and I live near the tiny rural town of Albin, WY, founded in the late 1800’s by hardy Swedish immigrants who settled in this area under the Homestead Act. My extended family’s ranch where I work was one of those original homesteads. My two adult children are married with families of their own which means I have 3 granddaughters and 2 grandsons who know me as “Mema.” Whether its participating in activities with the three who live an hour away or hiking and learning to kayak with the two who live across the state (500 miles away), my grandkids bring much joy to my life. My ranch responsibilities include checking fences, chopping ice in water tanks during the winter, checking for sick animals and keeping records on our cattle. There’s never a dull moment with ranch life—nor is there much of a routine. “Active” definitely describes my life – on the ranch and at church. As God works in and through me, I manage to juggle serving on the Worship Team, putting together music and Power Points for weekly services, and playing the organ; Sunday School Superintendent and serving on the Christian Education committee; and part-time secretarial work including the church bulletin! One project that impacted my life was bringing the Truth Project Simulcast training to my local church and then leading several small groups through this worldview curriculum. Through studying the book, “LORD, I Want to Know You” God led me to my first Inductive Bible training workshop in 2004. As the Holy Spirit helped me discover truth for myself, He also gave me opportunities to lead others to do so as well through several Precept small group studies. I began leading Precept Online Bible studies three years ago. What a blessing it has been to study with people who have a passion for knowing God’s Word. My mission is summed up in 2 Timothy 2:15—“Be diligent to present yourself approved to God as a workman who does not need to be ashamed, accurately handling the word of truth.” The desire of my heart is to know God deeply through His Word so that my life reflects His glory giving all those around me an accurate view of who He is. I pray that you will join one of our online classes to discover truth for yourself!